While travelling around to different resorts and campgrounds, we enjoy checking out the "neighborhood" as we take Molly on her walks. That's the excuse anyway. 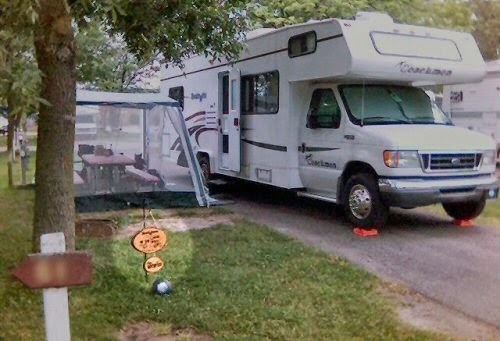 We really just enjoy being out, and seeing how other RVers decorate or do things. There are some great ideas how to setup camp out there! Some people gather all the chairs around the fire ring, while others open up a storage bay and gather round a big screen TV tucked inside. Some parents setup a screened in gazebo to eat under, while others pull the picnic table close to the RV to take advantage of the awning. Sometimes on our walks we see elaborate setups, and some people just put out a folding chair or two. It's great how we all can camp and enjoy the outdoors differently. For the RoadAbode Crew, how we setup depends on how long we are staying. Less than three days, and we'll put out our camp chairs as we need them. For longer stays, we'll setup our ez-up shade room, our boot-brush stand, a few of our interlocking floor foam pads as a patio mat, and our chairs, with one or two at the ready for guests. We cover the the top and benches of the picnic table with nice matching red plaid covers. We hang up some nice lights under the canopy - not too bright, but good for sitting and playing cards or board games. The last thing I like to put out in a prominent spot on our campsite is our Camp Sign. We've seen some great signs over the years. It gives you a sense of the family or couple that are staying there. Some speak to "who's the boss" (Mom). Others about how blessed they feel to be out together. What teams they root for, or a little of their wit. Sometimes it's letting you know all about the owner's kids, grand-kids or "furbabies." As we walk with Molly past our camping neighbors, I wonder what are the stories and adventures that are behind the signs we run across. Our RV campsite sign is pretty simple. Just a slice of a log with a burned-in image of RoadAbode, our name, RoadAbode logo and this blog's address. The story how we got our sign is maybe a little different though. My parents both passed away in 2005. My Mother in the spring, and my father followed along in the fall. While doing the arduous task of cleaning out their home with my wife and brother, I found on my father's basement workbench a wood-burning kit I had gotten him a few years back. "Opa" when he was well was a great whittler and woodcarver, making figurines, animals and other decorative objects. His art was crafted from small blocks of cherry, walnut, cedar and other woods he would procure through various methods. As he got older, he carved less. I thought the wood-burning starter kit, with instructions and "hot-knife" might give him a creative outlet. When I found the wood burning kit in his workbench, I was at first a bit perturbed. "He didn't even open it!" But I realized I had given it to him before his world had changed drastically; my mother passed, and his health declined. I decided the wood burning kit was one of the things I would use to remember him by - to remember when he could be artistic, and proud of what he could accomplish. That winter I set to work on the large and small slabs of wood that came with the kit. I'm not particularly artistic, but I can use computer software to manipulate images pretty well! So I created an image in black and white, an outline of a Class C RV. I made sure to draw in where RoadAbode's door and windows are. Then I flipped the image backward in the software, and printed it from our inkjet printer in "Best" mode - using the most ink. I used this mirrored image, and placed it on the wood face down, and using a tablespoon, rubbed the inked side onto the wood surface. It worked! The ink transferred and gave me a good template to follow for wood-burning. The wood-burning was an interesting process, and I had to be careful - that "hot-knife" could burn skin just as quickly as wood! I also transferred our family name to the smaller wood cut using the same process. After completing the burning to what I thought looked presentable, a few spray coats of polyurethane sealed the piece, and a few eye hooks and length of chain pulled RoadAbode's camp sign together. A shepherd's crook hanger lets us put it on whatever spot has some soft earth so we can put it on our campsite. Our Camp sign may not be the funniest, or most inventive we've seen, but it does hold a special place in our heart when we display it. 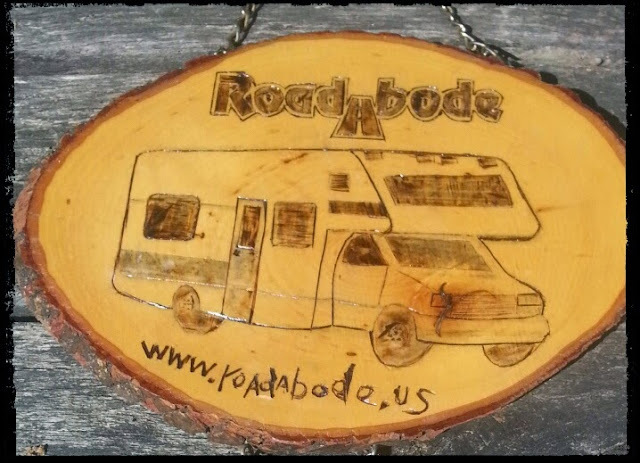 Our camp sign lets other RVers and campers know - "RoadAbode is Here!" 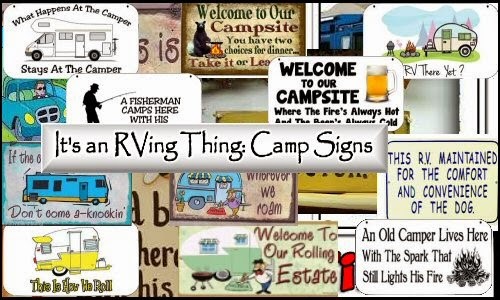 Do you have a camp sign? does it hold an interesting story? We'd love to hear about what kind and why you have the sign that you do. Happy RVing!